Read the Patient Information Leaflet and instructions that come with this product before you start using desmopressin and each time you get a refill. If you have any questions, consult your doctor or pharmacist. Follow the instructions on how to properly prime the bottle if you are using it for the first time or if you have not used it for a week or more. 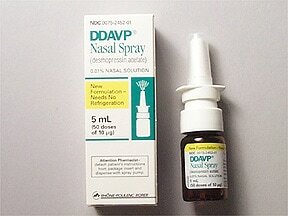 Spray this medication in the nose, usually 1 to 3 times a day as directed by your doctor. If the dose is more than 1 spray, spray half the dose in each nostril. For example, if the dose is 2 sprays, give 1 spray in each nostril. Keep track of the number of sprays used from each container. Discard the container after you have used the number of sprays specified on the package. What conditions does DDAVP Aerosol, Spray With Pump treat? List DDAVP Aerosol, Spray With Pump side effects by likelihood and severity. Changes inside the nose (such as scarring, swelling, congestion, or blockage) may affect how well desmopressin nasal spray is absorbed. Tell your doctor if you have any of these changes inside the nose because he or she may need to adjust your treatment. What should I know regarding pregnancy, nursing and administering DDAVP Aerosol, Spray With Pump to children or the elderly? 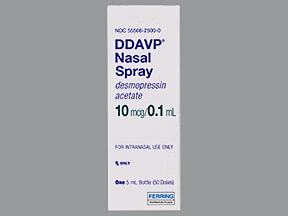 Does DDAVP Aerosol, Spray With Pump interact with other medications? Store at room temperature between 68-77 degrees F (20-25 degrees C) away from light and moisture. Keep the bottle upright. Do not store in the bathroom. Keep all medicines away from children and pets. Are you taking DDAVP Aerosol, Spray With Pump? Are you considering switching to DDAVP Aerosol, Spray With Pump? How long have you been taking DDAVP Aerosol, Spray With Pump?